India is one of the world's oldest civilizations and Hinduism is one of the world's oldest religions. The Indian culture is often labeled as an amalgamation of several cultures, spans across the Indian subcontinent and has been influenced and shaped by a history that is rich and several thousand years old. It has complex roots, intelinked networks of relation, and involves a vast array of practices and a host of deities whom Hindu people worships. India is the birthplace of Hinduism, Buddhism, Jainism and Sikhism which are collectively known as Indian religions. Its plethora of forms and beliefs reflects the tremendous diversity with a miraculous unity of India, where most of its one twenty five billion followers reside. Hinduism is more than a religion. It is a culture, a way of life, and a code of conduct and behavior. This is reflected in a term Indians use to describe the Hindu religion: Sanatan Dharma, which means eternal faith, or the eternal truth. The Indus Valley civilization, located in what is now Pakistan and northwestern India, which flourished between approximately 2500 and 1700 B.C.E., and persisted with some regional presence as late as 800 B.C.E. The civilization reached its high point in the cities of Harrapa and Mohenjo-Daro. Although the physical remains of these large urban complexes have not produced a great deal of explicit religious imagery, archaeologists have recovered some intriguing items, including an abundance of seals depicting bulls, among these a few exceptional examples illustrating figures seated in yogic positions; terracotta female figures that suggest fertility; and small anthropomorphic sculptures made of stone and bronze. Material evidence found at these sites also includes prototypes of stone linga (phallic emblems of the Hindu god Shiva). Later textual sources assert that indigenous peoples of this area engaged in linga worship. According to recent theories, Indus Valley peoples migrated to the Gangetic region of India and blended with indigenous cultures, after the decline of civilization in the Indus Valley. A separate group of Indo-European speaking people migrated to the subcontinent from West Asia. These peoples brought with them ritual life including fire sacrifices presided over by priests, and a set of hymns and poems collectively known as the Vedas. a belief in many gods, which are seen as manifestations of a single unity. These deities are linked to universal and natural processes. Hinduism is bound to the hierarchical structure of the caste system, a categorization of members of society into defined social classes. An individual's position in the caste system is thought to be a reflection of accumulated merit in past lives (karma). Observance of the dharma, or behavior consistent with one's caste and status, is discussed in many early philosophical texts. Not every religious practice can be undertaken by all members of society. Similarly, different activities are considered appropriate for different stages of life, with study and raising families necessary for early stages, and reflection and renunciation goals of later years. A religious life need not be spiritual to the exclusion of worldly pleasures or rewards, such as the pursuit of material success and (legitimate) pleasure, depending on one's position in life. Hindus believe in the importance of the observation of appropriate behavior, including numerous rituals, and the ultimate goal of moksha, the release or liberation from the endless cycle of birth. Moksha is the ultimate spiritual goal of Hinduism. How does one pursue moksha? The goal is to reach a point where you detach yourself from the feelings and perceptions that tie you to the world, leading to the realization of the ultimate unity of things-the soul (atman) connected with the universal (Brahman). To get to this point, one can pursue various paths: the way of knowledge, the way of appropriate actions or works, or the way of devotion to God. While there is no one text or creed that forms the basis of all Hindu beliefs, several texts are considered fundamental to all branches of Hinduism. These texts are generally divided into two main groups: eternal, revealed texts, and those based upon what humanity has learned and written down. The Vedas are an example of the former, while the two great epics, the Mahabharata and Ramayan, belong to the latter category. For centuries, texts were transmitted orally, and the priestly caste, or brahmans, was entrusted with memorization and preservation of sacred texts. The Vedas are India's earliest surviving texts, dating from approximately 2000 to 1500 B.C.E. These texts are made up of hymns and ritual treatises that are instructional in nature, along with other sections that are more speculative and metaphysical. The Vedas are greatly revered by contemporary Hindus as forming the foundation for their deepest beliefs. The early Vedas refer often to certain gods such as Indra, the thunder god, and Agni, who carries messages between humans and the gods through fire sacrifices. Some of these gods persist in later Hinduism, while others are diminished or transformed into other deities over time. The Vedas are considered a timeless revelation, and a source of unchanging knowledge that underlies much of present-day Hindu practices. These two great epics are the most widely known works in India. Every child becomes familiar with these stories from an early age. The Mahabharata is the world's longest poem, with approximately 100,000 verses. It tells the story of the conflict between the Pandava brothers and their cousins the Kauravas, a rivalry that culminates in a great battle. On the eve of the battle, the Pandava warrior Arjuna is distressed by what will happen. The god Krishna consoles him in a famous passage known as the Bhagavad-Gita (meaning "the Song of the Lord"). This section of the Mahabharata has become a standard reference in addressing the duty of the individual, the importance of dharma, and humankind's relationship to God and society. A second epic, the Ramayan, contains some of India's best-loved characters, including Rama and Sita, the ideal royal couple, and their helper, the monkey leader, Hanuman. 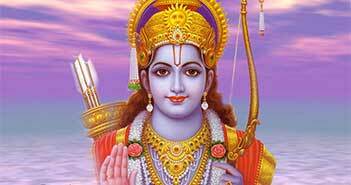 Rama is an incarnation of the God Vishnu. 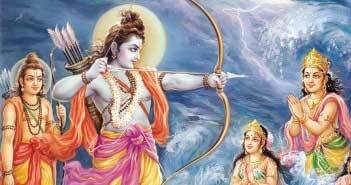 The story tells of Rama and Sita's withdrawal to the forest after being exiled from the kingdom of Ayodhya. Sita is abducted in the forest by Ravana, the evil king of Lanka. Rama eventually defeats Ravana, with the help of his brother and an army of monkeys and bears. The couple returns to Ayodhya and are crowned, and from that point the story has evolved to acquire different endings. Episodes of the Ramayan are frequently illustrated in Hindu art. 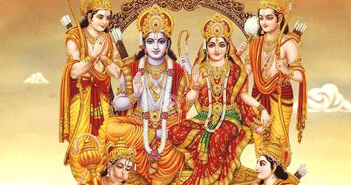 The Puranas are the primary source of stories about the Hindu deities. They were probably assembled between 300 to 1000 C.E., and their presence corresponds to the rise of Hinduism and the growing importance of certain deities. They describe the exploits of the gods as well as various devotional practices associated with them. Some of the Vedic gods-Indra, Agni, Surya-reappear in the Puranas, but figure less importantly in the stories than do Brahma, Vishnu, and Shiva, the various manifestations of the Goddess, and other celestial figures. Around the same time as the recording of the Puranas, a number of texts concerning ritual practices surrounding various deities emerge. They are collectively known as Tantras or Agamas, and refer to religious observances, yoga, behavior, and the proper selection and design of temple sites. Some aspects of the Tantras concern the harnessing of physical energies as a means to achieve spiritual breakthrough. Tantric practices cross religious boundaries, and manifest themselves in aspects of Hinduism, Jainism, and Buddhism. Hinduism has a lot of rituals for peace and benefits. Its a step by step path following from birth till death which covers all the major events in the life of a human. Its not to follow all of them these days due to time constraint, busy ness and other social aspect but they all are highly recommended. Hinduism performs all the rituals and other spiritual practices to break the Cycle of Birth and Death. There are 16 Sanskars (Solah Sanskar) as described below which are majore rites to perform in a human life in Hinduism. Garbhadharan is the first Sanskar done immediately after the marriage. The most primary biological urges in one's life is his/her sexual desire. We need to live in the material world to awaken our spirituality. Pumsavana Sanskar is a ritual done in the third month of pregnancy as per Hinduism sacred and ancient texts. This is also known as the quickening of the fetus for a male child. Simantonnayana Sanskar is performed after Pumsavana sanskar in the last trimester of pregnancy. The main purpose is the safe delivery of baby and health of both mother and child. Jatkarma Sanskar is a ritual done immediately after a male child is born. According to Jatkarma Sanskar, it is a celebration of child born and his bonding with his father. Naming ceremony performed on the 12th day of the birth. As all the activities in the world are carried on the basis of name so this is a very important of all sanskars. Nishkraman Sanskar is a ritual done when child is first taken out of the house. Nishkraman Sanskar is an important Vedic Sanskar associated with a new born baby. Annaprashan Sanskar is when a child starts to eat solid food in the sixth month. Annaprasanna Sanskar is a ritual that marks an infant's first intake of food other than milk. Mundan Sanskar means cutting the child's hair for the first time. This sanskar should take place by the end of third year. Child's hair are shaved with only a shikha left, a tuft at the crown in the head. Karnavedha Sanskar is also known as Ear piercing ceremony. Karnavedha is one of the Hindu Sanskars performed for a child. It is an ear piercing ceremony that is performed on the 12th or 13th day after the birth. Vidyarambha Sanskar means starting the education of a child. It typically beigns in the fifth year. Vidyarambha Sanskar is performed to mark the beginning of the education to gain knowledge, and alphabets are taught. Upnayan Sanskar is also known as Sacred Thread Ceremony. Upanayan is one of the traditional sanskars (rites of passage) that marked the acceptance of a student by a guru (spiritual teacher). Praishartha Sanskar (or Vedarambha Sanskar) is the learning and understanding the core concepts of Vedas and Upanishads in Gurukul. This is the mark of starting the Vedic knowledge in Gurukul. Keshanta is for boys and Ritushuddhi is for girls. Once the Veda education is over in Gurukul, student have to perform the shave. Ritusuddhi is a ceremony associated with a girl's first menstruation event. Samavartana Ceremony is also termed as Graduation is perofrmed at the end of formal education. It is also known as Snana. This is also termed as the mark of ending of the Brahmacharya Ashram in human life. Vivah Sanskar, also known as Marriage ceremony is a sacred union of two soul s - An entry into the dignified family life. Hindu Dharma has prescribed four Purusharthas (Four basic pursuits of life), that is Dharma, Artha (Wealth), Kama (Desires) and Moksha (Salvation). Antim Sanskar is a ritual done at the time of funeral and cremation. This is the last rite of a human being. Everything that comes into the existence has an end too and for evey event, there is a ritual in Hindu Dharma.